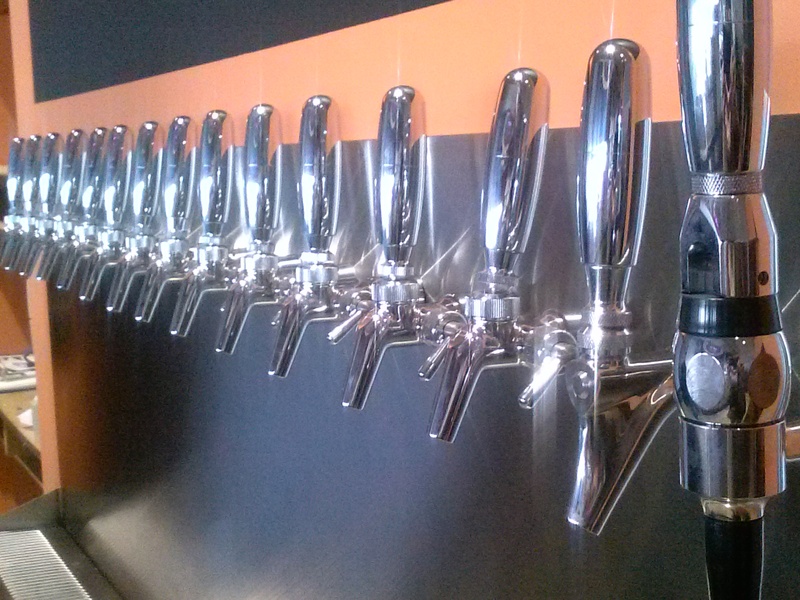 The tap room features 32 taps – 12 of them on shared lines – and will serve basics like flatbreads and sandwiches. The beer selection, obviously, will focus on Flat 12 brews, but there will be occasional guest taps and tap takeover events. In all, the space at 130 W. Riverside Drive (just a few blocks east of Buckhead on the River) is about 4,200 square feet, which includes the tap room and deck, as well as the cooler area and space that will eventually house a brewing operation. For the first few months at least, beer served at the Jeffersonville location will be brewed in Indianapolis. Eventually, Flat 12 may even serve coffee, according to tap room manager Shanna Henry, who was at one time a barista in Seattle. And in addition to many specialty beers, one of the house specialties will be a hop-infused olive oil that will be used with menu items. The first tap room promotion will be a “12 Beers of Christmas” event spanning three weeks. Four new beers each week will be unveiled leading up to the holiday, including three versions of Flat 12’s popular Pinko, a bourbon barrel-aged Russian imperial stout. One of those is aging currently in a Pappy Van Winkle 23 year barrel. Other Flat 12 favorites will be staples as well, such as Spirit Mover Saison, Joe Brahma Coffee Brown Ale, Kattenstoet Belgian Pale and Hammer Down, a smooth pilsner beer inspired by NASCAR driver James Hinchcliffe. Price points and a final menu are being worked out, but pint prices should range from $4 to $6 depending on the beer style, and growlers will be sold as well. 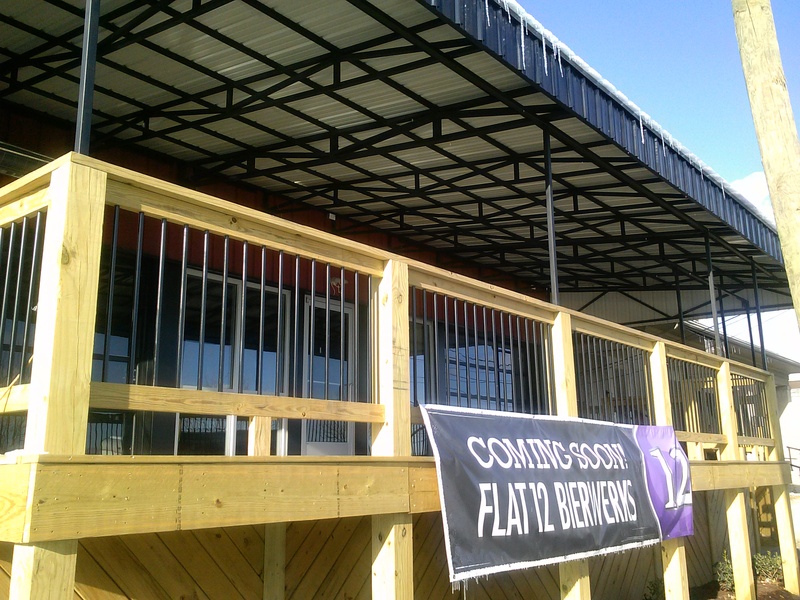 Flat 12’s regional sales manager Eric Finch said the new facility should be brewing by the end of summer 2015. He said the Indianapolis brewery currently produces about 20,000 barrels per year, and that the Jeffersonville brewery will probably brew about half that amount. Part of the strategy is to get Flat 12 production farther south to assist the brewery in expanding its market to the South and Southeast. As for exactly which beers will be brewed in Jeffersonville versus Indy, and the exact setup of the brewery, Finch said that’s still being worked out. And part of Flat 12’s plan is to become as local as possible by hosting events, getting involved in community happenings, collaborating with Louisville-area breweries and generally being a local presence rather than an annex of the Indianapolis brewery. Another part of the complex, which is behind an adjacent restaurant, will become an event space and later will be converted into a storage cooler, space for another small brewing operation specifically for experimental brewing and barrel room. Finch referred to the soon-to-open location as a “toddler” that has lots of room to grow. And while Flat 12, whose beers came to Louisville taps earlier this year, considers itself part of the Louisville brewing scene, management chose Indiana for more than just logistics and ease of transition. Jeffersonville’s downtown is growing and has seen a spike in foot traffic since the Big Four Bridge opened. Perhaps the jewel of the space is a front deck that overlooks the Ohio River. It will be equipped with roughly 10 picnic tables and is sure to be a destination place during warm weather months and downtown events. Inside the tap room, décor is a combination of aged metal and reclaimed oak palette slats from the Indianapolis brewery. 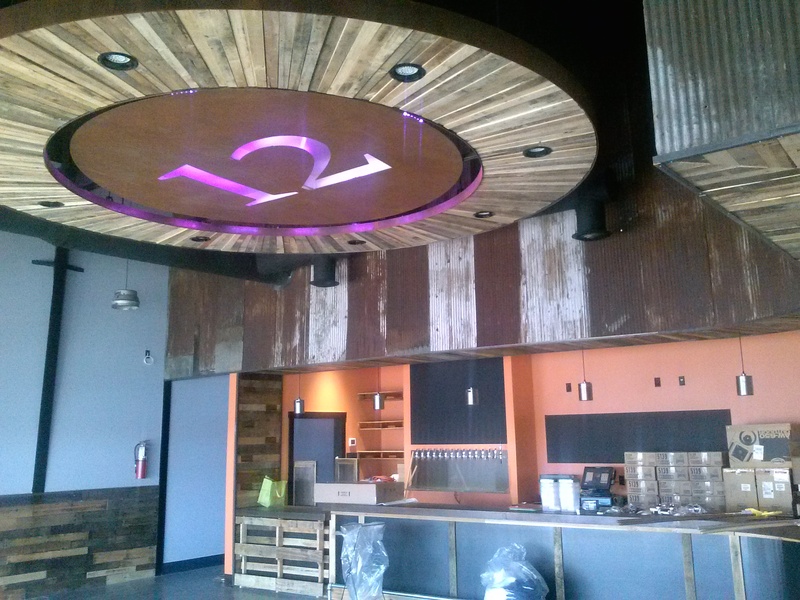 In the center of the room, suspended from the ceiling, is a huge round Flat 12 logo light; eight round tables that will be placed inside the tap room will also bear that logo. The L-shaped bar will have about 10 barstools for additional seating, and hanging lights made from kegs will help illuminate the space. All in all, the total space should be able to hold just under 100 people. Meanwhile, the limited menu is in place not to compete with nearby restaurants such as the Olive Leaf Bistro next door, but rather to serve as a before and/or after stopping point for people going out for the evening to dinner or other events.